I've been finding lately that by the time I get the kids dressed, fed, hair done, shoes on, teeth brushed and ready to go out the door, I have barely had time to get dressed and ready myself. Lately I've been so neglectful of myself that it's been nearly noon and I'll realise I haven't even had water yet! Really not good. So to do something about it, I've made these healthy and delicious Banana Blueberry Muffins that I can just grab and go in the morning, so even though I'm still short on time for myself, at least I'm still eating the most important meal of the day. For recipe click below. Step 1: Preheat a fan forced oven to 175 degrees Celsius. Line a 12 case muffin pan. In a large mixing bowl, mix together quinoa, flour, baking powder, baking soda, salt. Set aside. Step 2: In another mixing bowl, mash bananas then add the brown sugar and caster sugar and mix. Next mix in the egg, oil and buttermilk. Step 3: Slowly mix in the dry ingredients with the banana mixture until well incorporated. Step 4: Gently fold in the blueberries being careful not to mash them. 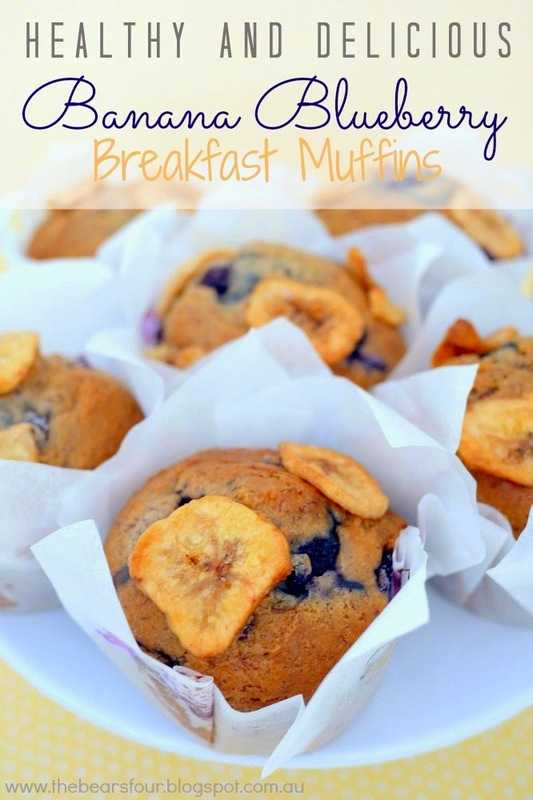 Pour the muffin mixture into each muffin case and top with a couple banana chips. Step 5: Bake for 20-25 minutes. Cool on a wire rack.